Internet Explorer ships with Microsoft’s Bing as its default search engine. If you want to change to Google in the Windows 8.1 desktop version of IE, it’s remarkably difficult. 1Start the desktop version of IE. Again, it doesn’t look like you can do this from the tiled version of IE. 2Click the down arrow next to the magnifying glass, up in the address bar, and in the lower-right corner, choose Add. 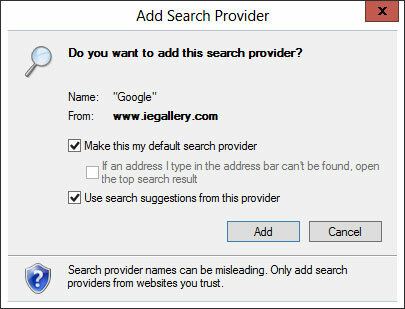 IE takes you to the Internet Explorer Gallery with Search Providers selected. 3Look. When you find the Google search logo, click it. 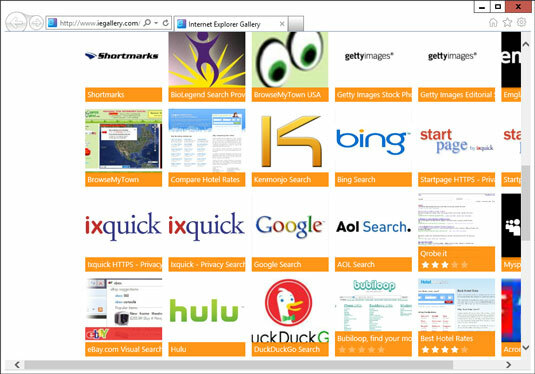 IE brings up the Internet Explorer Gallery highlighting Google Search. 4Click Add to Internet Explorer. 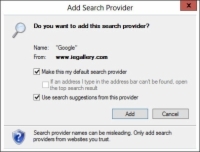 IE responds with a dialog box called Add Search Provider. 5Check the box marked Make This My Default Search Provider and Use Search Suggestions from this Provider. Then click Add. IE doesn’t say a thing, but it changes your default search provider to Google. How can you tell without running a search? Click the down arrow next to the magnifying glass icon again, and at the bottom, the tiny Google icon appears to the left of the Bing icon. That’s how you know Google’s the default search engine. From that point on, you can type your search terms in the address bar and press Enter, or tap or click the magnifying glass icon, and IE sends the search terms to Google.